In Relentless John Bevere challenges us take our faith to another level. Many Christians aren’t walking in the Power available to them through the life-changing Grace of God through Jesus Christ. Why? Because they are unaware. This was eye opening for me! How can so many Christians be unaware of the authority and power they have in Christ. Through personal stories and Scripture John dissects the true grace of God and shows us how it can bring us the power we desperately need to live in our world today. 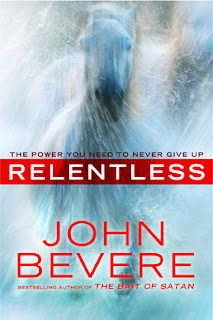 Relentless by John Bevere is a must read for serious believers. It’s an easy, enjoyable read that delivers on content while supplying the tools we need to reach our goal.